Liberal Racism? 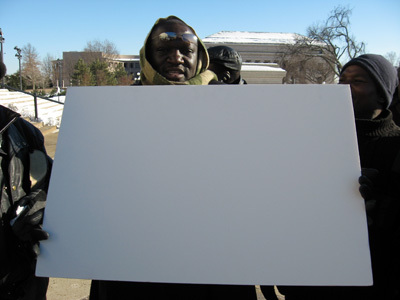 Anti Tea Party Facebook Group Uses Photoshopped Pic of African-American Protest for its Own Agenda. I know politics in America is ever more partisan and fraught, but this is pretty damn low. Dishonesty in politics – using someone else’s image to promote your own agenda. The text on the placard, whilst it passes a cursory glance long enough to read it, is plainly photoshopped. The placard is being held at a slight angle to the camera, yet the text is fully face on and too clear for a home made sign. It’s clear that the message on the placard has been crudely ‘shopped on to it. And that’s what so distasteful about this whole thing. Whoever has done this has seized on the fact that the placard holder is an African American, and tailored the Occupy message, talking about how “the tree of life is dying” as though because this man is of African descent he thinks and speaks like a character from The Lion King. What this is, then, is the appropriation of an African American to pursue a resolutely white liberal agenda. It purports to show that the movement is embraced by all classes and colours, but it’s actually a cynical use of ethnicity to validate a political ideology. This is the original image from Minnesota MPR News with the original caption reproduced. Mr Otieno and his friends were trying to draw attention to the plight of friends and families in Kenya. They were protesting at the lack of interest the mainstream media has shown in the deteriorating political situation there with people allegedly held without trial. They wanted to know why the media and the American President, Barack Obama, seemed to be silent on the situation in Kenya. MPR reports the protester’s accounts of massacres and starvation, repression and illegal detention. It’s a distressing story, and one the media – and popular liberal Facebook groups for that matter – seem completely uninterested in. So what do they do when they see this image of a man who is so distressed he weeps for his family and friends every night? They take that image and plaster their own agenda on top of it. To add insult to injury, they frame the protest in a patronising pastiche of African culture, as though all African Americans think like something out of Avatar. Then they hawk it around Facebook, gleaning literally hundreds of shares and tens of thousands of views. Visit the pages and see how many commentators gleefully speculate on how “Faux News” might “spin” this image. All the time unaware that the image is dishonest and, let’s face it, frankly racist. If this cynical misuse of an honest protest, and the hijacking of a man’s ethnicity and culture in pursuit of the liberal agenda annoys you, help get the message out there. Share this post. That’s pretty ironic. 99.3% of Americans take home more than the average Kenyan each year. The “99%” who is opposing the 1%, is, well, the 99% in this case. The average income in Kenya is $1,700 per year. You can’t make this stuff up. How dare they use my picture without my permission and how can they Photoshop my pictures am giving them 24 hours to remove this picture otherwise the operator of http://www.aattp.org will face me in court . Return of the Arctic Death Spiral! (again). More Classic Guardian Spin: Koalas “Threatened” by Global Warming & Development. Berkeley Student Gets a “Fail” for her Global Warming Essay. Coal Use Rockets in “Low Carbon” EU – Up By 1/3 in UK in Just ONE Year. CDC Claim Earthquake is a Type of Weather. Wait, What? Save Arctic Wildlife: By Shooting it?